It’s time for another Team A ScrapMuch? Sketch-y Friday reveal, and the last February reveal for Team A. Which means spring is right around the corner. I hope. It’s another week that I’ve dug into my stash and finally started to scrap things I’d been planning for a while. If only I had all the time in the world to scrapbook all my ideas I’d have no stash, full albums, and likely no job (hah!). I’ve noticed somewhere in my archives that the inspiration sketch becomes a broken image, so I’ll be sharing the sketch last because the broken image irritates me a bunch. This picture has a ton of meaning to me, and I bought this paper to go along with this phase in my life. It was a page of tremendous growth and self discovery after a very difficult time. It’s from my first time at High Park for cherry blossom season. It was a time where I was starting to bloom, yet ever fragile, just like the cherry blossoms. There’s a little bit of hope to go with that too – that the trees survive the cold, bitter winter and produce beautiful blooms anyway. So just like life – you can go through some harsh, bitter times to a time of great beauty. 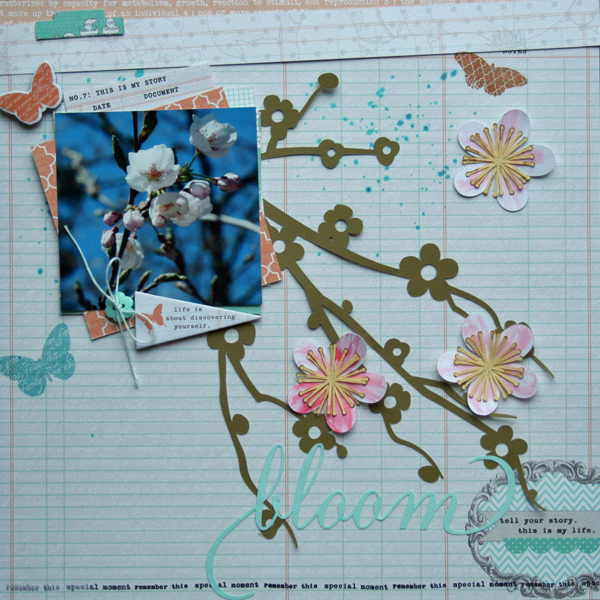 The paper blossoms were cut with my Silhouette and then I used some Tim Holtz distress ink on my splat mat and a waterbrush to create the multi-toned flowers. I learned the technique quite some time ago at one of my scrappy events. Laura has posted a waterbrush tutorial on her blog here. So now it’s your turn, of course! Hop on over to the ScrapMuch? blog to see what the rest of the team has created for inspiration this week. Then create your own and link up with us! Here is a run down of our Sketch-y Friday rules. Just link up your creations in our sidebar to be entered into a random draw for our monthly prize. You have until February 28th, at midnight to participate in any of this months sketch challenges, each linkup tool will remain open until that date! « ScrapMuch? and Stuck?! Sketches Pairing! Your layout is as beautiful as your story. Well done! Love this, your die cutting is perfect for your photo and the water colouring looks fab! This is so beautiful Tiiu, both the layout and the meaning behind this photo. I really like the layering, the die cuts are perfect. Awesome! Gorgeous layout! I love your flourish die cut. It matches the picture on your layout very well! Great colour combination and so soft!